Malaysia is at a significant juncture historically, poised on the brink of massive development that will transition the nation into a high-income economy. The thrust of this development is not, however, purely economic as emphasis is also being placed on creating more equitable distribution of wealth so as to ensure a better standard of living for all Malaysians. One industry that stands to contribute to the physical and psychological well-being of the nation while also promoting its economic success is healthcare. And, within this wide-ranging industry, the pharmaceutical sector in particular has a critical role to play in continuing to uplift the quality of life through better health while also supporting various income generating initiatives that have been identified under the Government’s Economic Transformation Programme (ETP). The Pharmaceutical Association of Malaysia (PhAMA), which represents leading multinational pharmaceutical companies that have a presence in the country, is confident that the sector can deliver the kind and magnitude of sustainable growth required by the ETP. In its inaugural industry fact book, Innovating for a Healthier, Economically Vibrant Nation, it presents a snapshot of the industry and highlights the strong potential for its further development. As the title of the book indicates, it focuses on PhAMA member companies’ contribution to both the health of Malaysians and the wealth of the nation. It describes how these companies have been meeting the healthcare needs of Malaysians through the years, and how they continue to monitor the changing health profile of Malaysians and introduce into the country a series of better, more effective drugs to combat prevalent diseases. The industry fact book also highlights the cornucopia of ways in which multinational pharmaceutical companies work towards achieving their ultimate aim of saving lives and improving health. The world over, MNC pharmaceutical companies lead in corporate social responsibility (CSR) efforts that benefit the underprivileged and marginalised. In Malaysia, these companies complement the Government’s initiatives to educate the public on disease prevention and management, while also providing invaluable aid in terms of free medical screenings and treatments with best-in-class drugs for those who need them but cannot afford them. 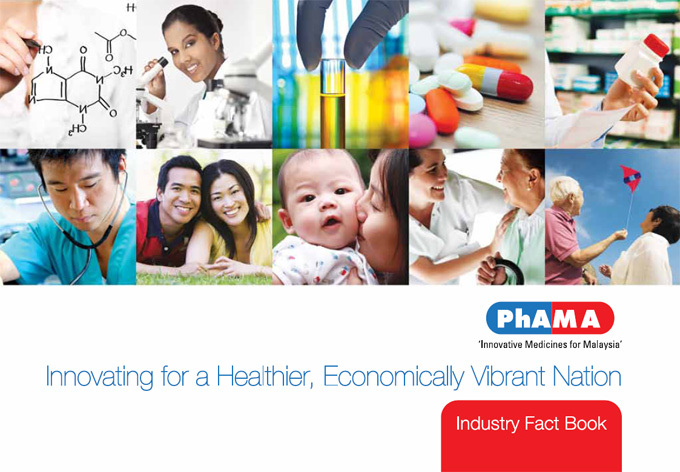 Towards the country’s economic advancement, the industry fact book states that multinational pharmaceutical companies have created thousands of jobs, pay an average of RM146.8 million in annual taxes per company, and provide a framework that supports further growth of the county’s gross national income (GNI). MNCs are already promoting a healthy clinical trial ecosystem, which has been identified as one of the Entry Point Projects to increase the performance of this sector. With greater collaboration across the board in the healthcare sector, they are also in a strategic position to support the technology transfer required to grow a robust manufacturing base; and to enhance Malaysia’s potential as a medical tourism destination. And this is what PhAMA has set out to do. The PhAMA Industry Fact Book is the first step towards creating an open and transparent culture that would support such collaboration.